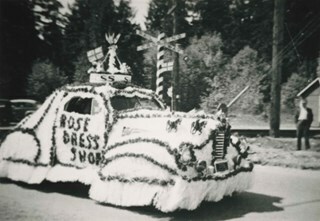 Photograph of a decorated car float in a May Day Parade on Patterson Avenue at a railway crossing. The automobile has "Rose Dress Shop" spelled along its side. Photograph of Jennie Montgomerie Patrick and Mrs. R.B. Glen standing in the fenced yard at the Glen family house. A dog is visible lying at Jennie Patrick's feet. Typed note in inside cover of card mount reads: "Mrs. R.B. 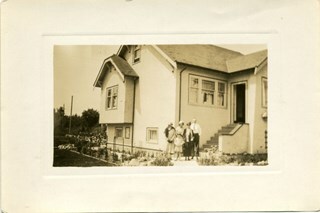 Glen's house on Patterson Avenue, Central Park, Burnaby, early 1920's, probably 1922 or 1923 or 1924. To the left the then Mrs. J.W. Patrick (nee Jennie Montgomerie) right Mrs. Glen." 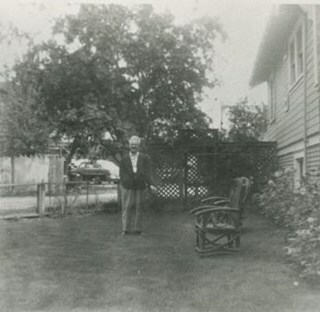 Photographer printed on card mount: "A Portrait by Weeks, 618 Granville Street, Vancouver." 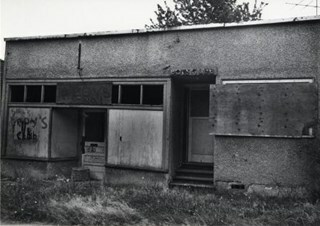 Photograph shows a vacant building onced used as a boys club, located on Patterson Avenue between Beresford Street and Wilson Avenue. 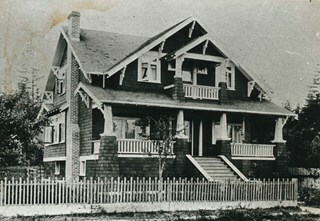 Photograph of the Field family home at 2543 Patterson in Burnaby. 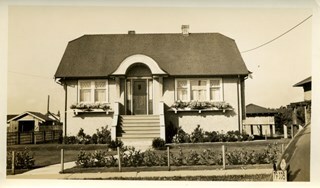 Photograph of the Field family home at 3543 Patterson in Burnaby. 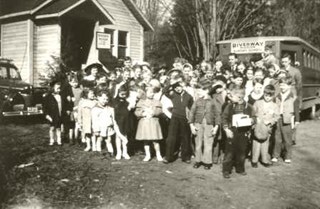 A group of people are gathered at the front of the house (most likely members of the Field family). 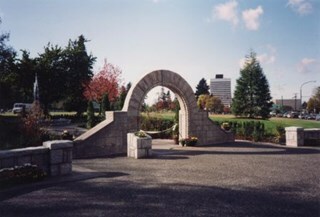 Photograph of the Earl and Jennie Lohn Perennial Garden and the restored Jubilee Grove Arch - taken during the opening of the gardens in 1994 after the restoration work was completed. This Central Park landmark was built in 1939 as part of "Jubilee Grove", a garden established in 1935 to commemorate the Jubilee of King George V and dedicated during Burnaby's May Day Celebration. 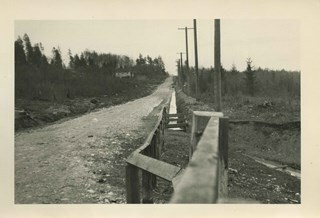 Photograph of Rumble Street looking east toward Patterson Avenue, located where the house on the left can be seen. 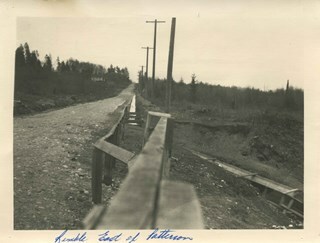 Annotation at bottom of Copy 2 reads, "Rumble St. just after Municipal dump was filled / Facing east house on left is where Patterson Avenue [is]"
Photograph of two men, one of whom is Alfred Hickman (not identified), standing outside his store on Patterson Avenue (later numbered 5932 Patterson Avenue), near the railroad tracks. 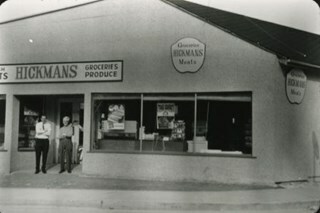 Signs on the store read, "Hickmans / Groceries / Produce" and "Groceries / Hickmans / Meats." Signs in the window advertise wieners and "Meat Makes the Meal." 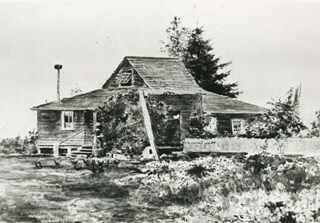 Photograph of a 1908 watercolour of the original Patterson homestead built in 1894 on Patterson Trail, now Patterson Avenue. 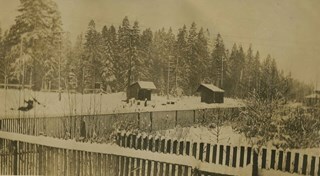 A woman feeding chickens can be seen by the front steps. 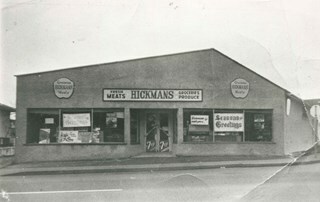 Photograph of the exterior of Hickmans Market. 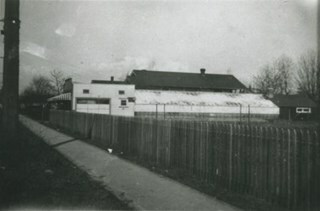 This store was owned and operated by Alf Hickman and was located on Patterson Avenue (later numbered 5932 Patterson Avenue). 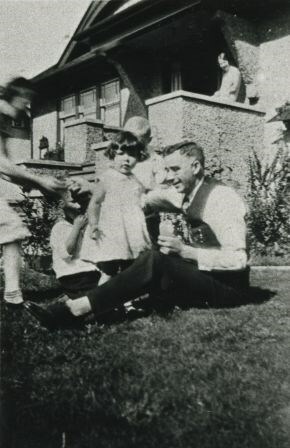 Photograph of Dr. Boyd McKee (seated) with daughter, Doree McKee (standing next to Dr. McKee). Bessie Farthing, boarder and close family friend, is on the steps in the background. 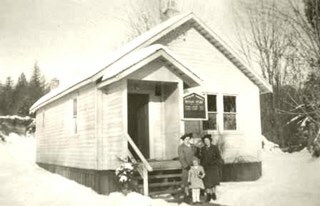 Doree McKee Piercy was also to become a doctor. 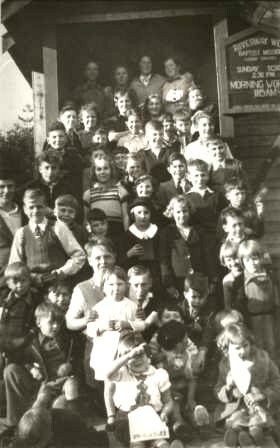 The photograph was taken at the family home, 3375 Patterson Avenue (later renumbered 5790 Patterson Avenue), where the McKees lived from 1926 to 1948. 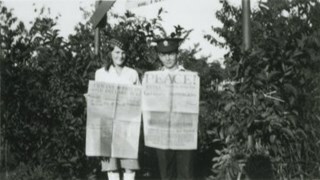 Photograph of siblings Jean and Ian Macdonald, at Rumble Street and Patterson Avenue, holding World War One era newspapers. One of the newspapers covers the outbreak of the War and the other proclaims the end. Photograph shows an apartment building called Times Square located at the corner of Maywood Street and Patterson Avenue. 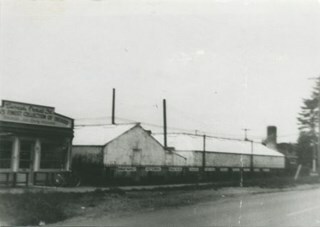 Photograph of the exterior of an orchid greenhouse of Burnaby Orchids Ltd. at 2803 Patterson Avenue. 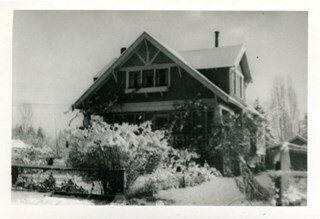 Photograph of a Burnaby Orchids greenhouse, possibly the one at 2803 Patterson Avenue. 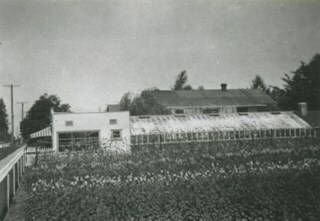 Photograph of an orchid greenhouse belonging to Burnaby Orchids Ltd. at 2803 Patterson Avenue. 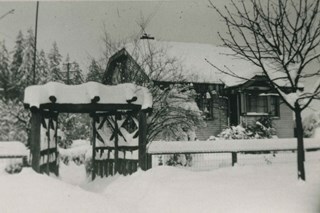 Photograph of the Central Park caretaker's house on Patterson Avenue in the snow. 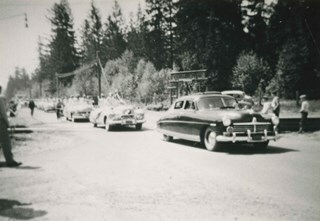 Photograph of May Day Parade on Patterson Avenue with a line of cars and floats driving down the street (the lead car is a Hudson). They may be passing by the Jubilee Grove Arch at Central Park. 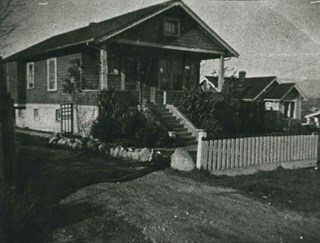 Photograph of the second Bond family home, on John Street (later renamed and renumbered 4144 Beresford Street; the site was then addressed as 6128 Patterson Avenue after the house was demolished). David Bond, the father of the family and also a carpenter, built this 14-room house in the Central Park district.